#22B Extra Fine: Featuring a bronze finish and medium stiffness, the #22B is suitable for Copperplate and Spencerian scripts, ornamental work and ruling. #56 Standard School: Possessing a stiff action, this nib is steady and durable, making it a perfect tool for beginners. #99 Drawing: This extremely flexible nib features an extra fine point and is capable of producing thick swells with minimal pressure. Perfect for artists with a light touch working on smooth papers. The #22B, #56 and #99 nibs may all be used with either a straight/classic style or oblique penholder. #100 Artist: Perfect for writing at x-heights of 1/8” or less, this highly flexible and delicate nib is best for use on smooth papers. #101 Imperial Artist: Perfect for use to create Copperplate or Spencerian scripts, the #101 is durable and steady. Ideal for expert and student scribes alike, the #101 is great for larger scale lettering projects. Both the #100 and #101 nibs may be used with either a straight/classic style or oblique penholder. #103 Mapping: Specialized for delicate work, the #103 is similar to the #100 in feel and experience, but less fragile. Perfect for artists with a light touch. #104 Drawing: For use to create very fine hairlines and small details, the #104 possesses a superfine point and should be used with the #104 penholder only. #512 Bowl-Pointed: Fine pen is best for ruling and lettering applications. #513EF: This extra-fine pen is ideal for industrial arts. The #103, #512 and #513 nibs may be used with either a straight/classic style or oblique penholder. #102 Crowquill: The #102 is super fine and flexible. #107 Hawk Quill: Stiffer than the #102, the #107 features a super fine point and is highly durable. 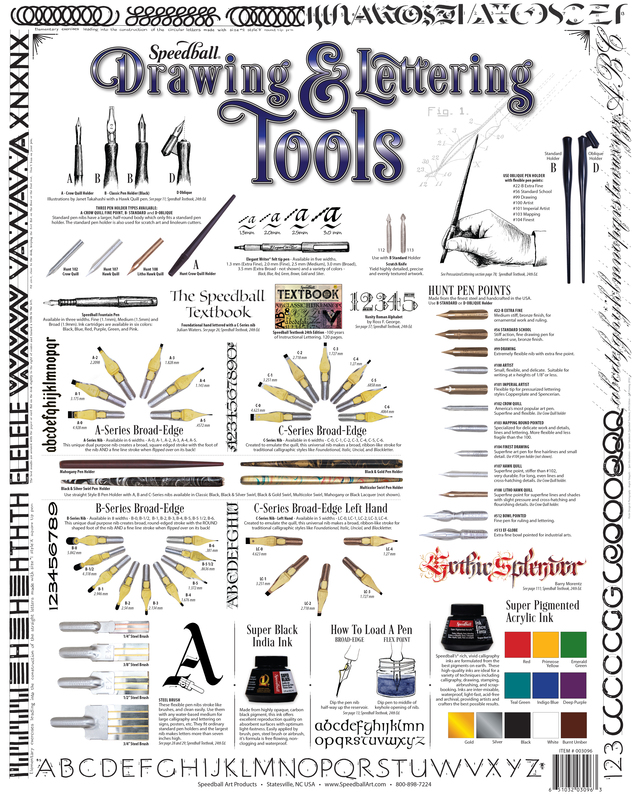 Best for creating long, even lines and cross-hatching details. #108 Litho Hawk Quill: The #108 is best for use for cross-hatching, flourishing and lithography. These nibs are only suitable for use with a crowquill holder. 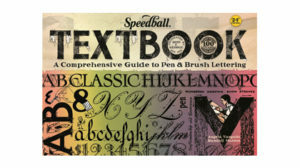 The Speedball Textbook® offers detailed instruction and inspiration for using these high-quality tools. Click here to learn more about this time-honored resource.